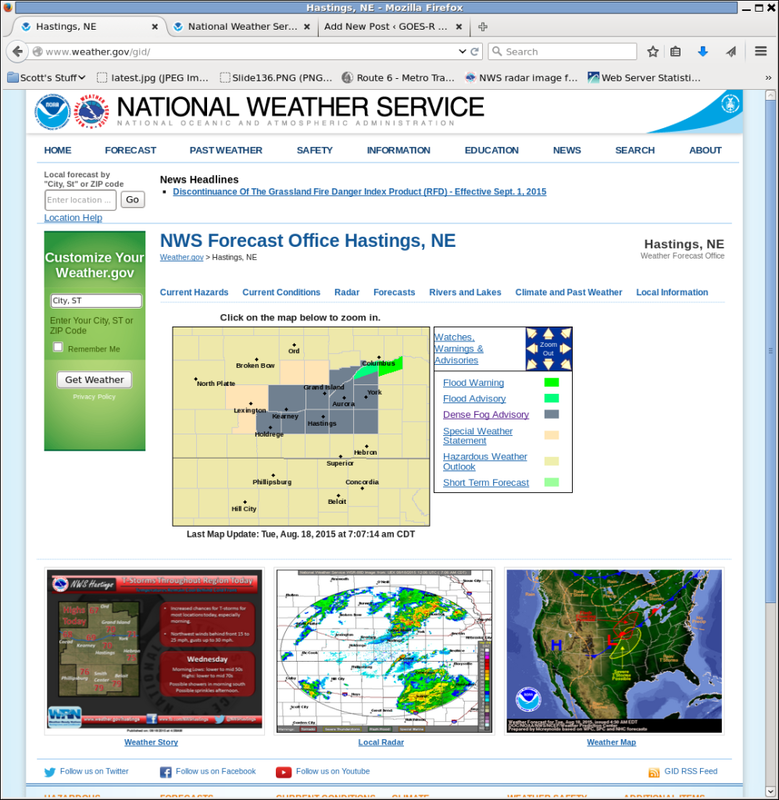 Dense Fog Advisories were issued by both Dodge City and Wichita WFOs on the morning of 31 August 2015. GOES-R IFR Probabilities in this case did a better job of outlining where IFR conditions were occurring, distinguishing those regions from regions of low stratus. Each of the paired images below shows Brightness Temperature Difference fields on top and IFR Probability fields on bottom, for four different times during the night (0530, 0715, 0915, 1115 UTC). IFR Probability fields show a signal that is confined mostly to regions where IFR conditions are developing (for the earlier times) or observed (at 0915 and 1115 UTC). Thus, IFR Probability in this case refines the brightness temperature difference signal, highlighting regions only where low clouds/fog are present (eastern Kansas), rather than regions where stratus clouds are present (western Kansas). The incorporation of near-surface saturation as predicted in the Rapid Refresh model is key to screening out regions of mid-level stratus when low stratus and fog are the more important field. When the sun rises, solar radiation with a wavelength of 3.9 µm will alter the brightness temperature difference field. At night, a water-based cloud will not emit 3.9 µm radiation as a blackbody and be perceived as colder (compared to 10.7 µm). During the day, the relatively large amount of 3.9 µm radiation from the sun reflected off the cloud will make the cloud appear to be warmer (compared to 10.7 µm). Thus the signal in the brightness temperature difference field flips. 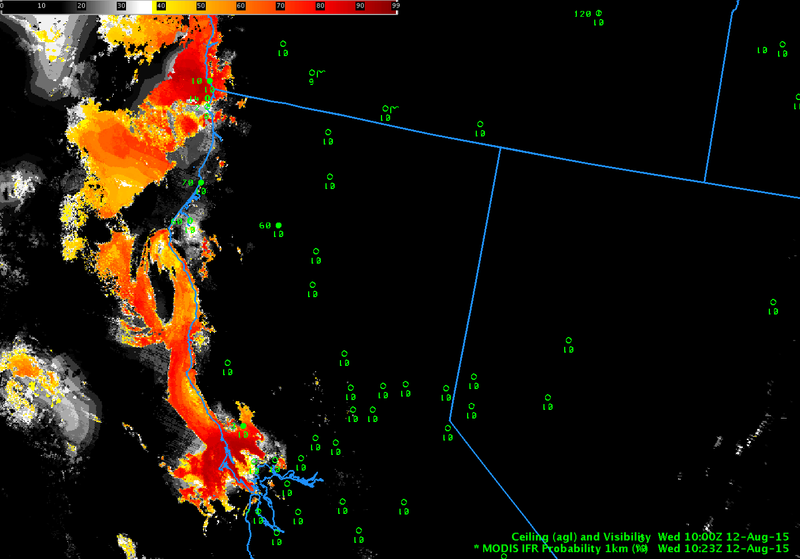 In contrast, the IFR Probability field signal is not significantly perturbed by sunrise. 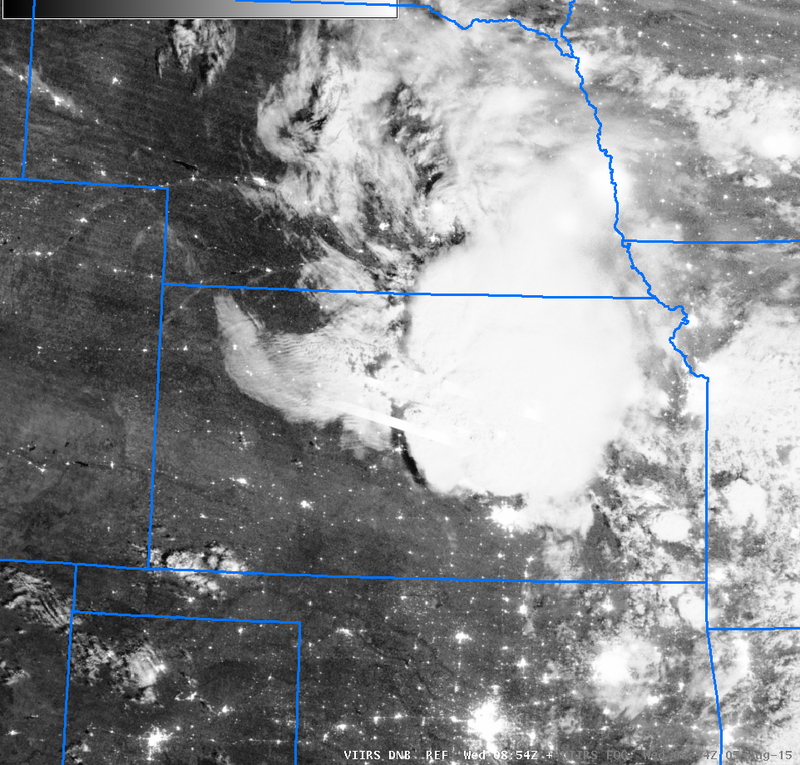 The 1315 UTC image, below, is an example of this. The GOES-R IFR probability field also benefits from better cloud clearing during the day. This entry was posted in Plains on August 31, 2015 by Scott Lindstrom. This blog post shows how IFR Probability fields can give an early alert to the development of IFR Conditions. 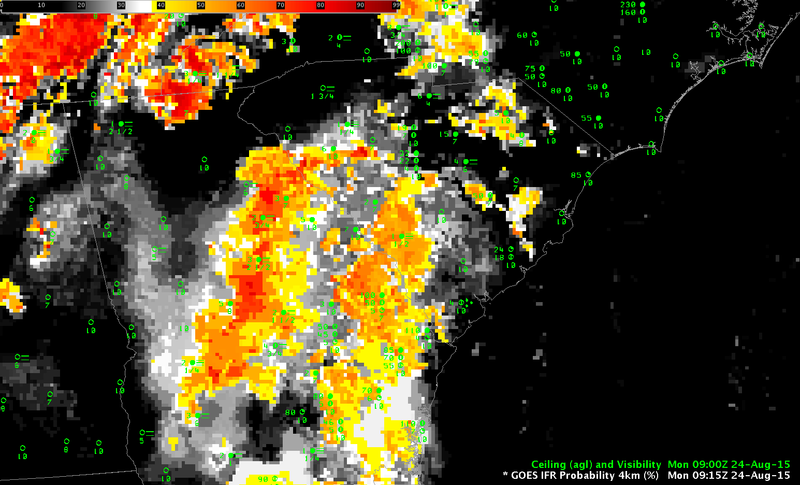 GOES-R IFR Probability fields from 0400 UTC on 24 August 2015, above, show enhanced probabilities over interior southeast Georgia. Observations of surface visibilities and ceilings do not show widespread IFR conditions. But the presence of enhanced values in IFR Probability suggest careful attention should be paid to this region. Three hours later (0700 UTC), IFR Probabilities have increased somewhat, and some observations are closer to IFR conditions. 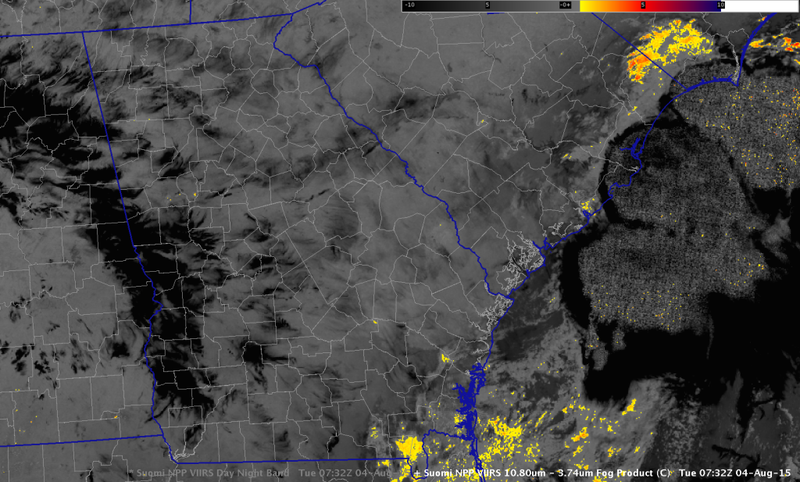 This is consistent with the slow development of radiation fog overnight over the southeast part of the country. By 0915 UTC, above, IFR Conditions are observed in regions where IFR Probabilities continue to increase. 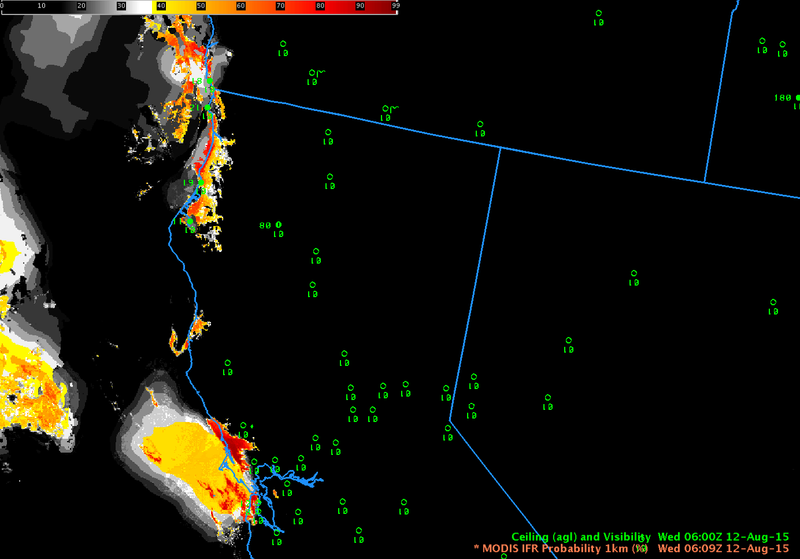 The increase in IFR Probability values continues at 1100 UTC, below, with numerous regions with values exceeding 90%. IFR Conditions are widespread over southeast Georgia and parts of adjacent South Carolina. IFR Probability fields are consistent through sunrise, with values exceeding 90% after the sun has risen, at 1300 UTC, above. The cloud-clearing that can be done with visible imagery at 1300 UTC means the edges of the fog field are more sharply defined at 1300 UTC than they were at 1100 UTC. This entry was posted in Southeast on August 24, 2015 by Scott Lindstrom. Dense fog developed over the piedmont of South Carolina/Georgia on 4 August 2015 in the wake of departing convection. The GOES-R IFR Probability fields, shown above hourly from 0400 to 1215, do parallel the development of the reduced ceilings and visibilities. 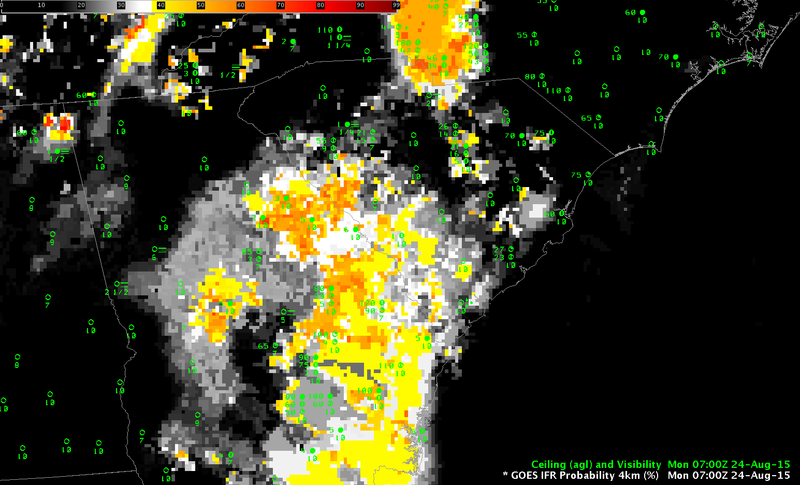 Brightness Temperature Difference fields, below, from 0615 to 1215 UTC, do not show a strong fog signal until after 0800 UTC, yet IFR conditions at that time stretch from Walterboro SC (KRBW) southeastward to Eastman GA (KEZM) and Baxley GA (KBHC). GOES-R IFR Probabilities therefore give a better head’s up to a forecaster tasked with monitoring ceilings and visibilities. Suomi NPP overflew the Southeast United States at ~0730 UTC on 4 August. 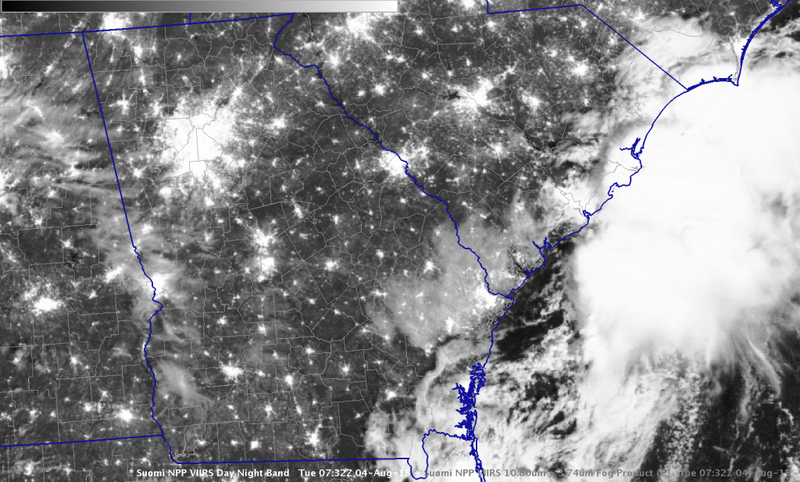 Ample illumination from the waning three-quarter moon showed cloudiness over southeastern coastal South Carolina and adjacent parts of Georgia but the brightness temperature difference field does not suggest that these are all water-based clouds (such clouds generally fall in the yellow or orange part of the enhancement). 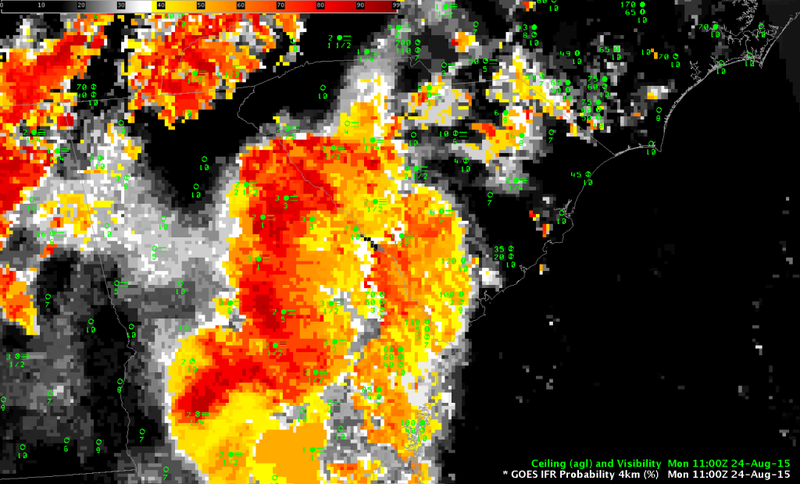 MODIS data from Terra and Aqua satellites can also be used to compute GOES-R IFR Probability fields, and two MODIS swaths were produced over South Carolina/Georgia early on August 4. Toggles between the 0337 Terra-based GOES-R IFR Probability Field and the 0755 UTC Aqua-based GOES-R IFR Probability fields are below. 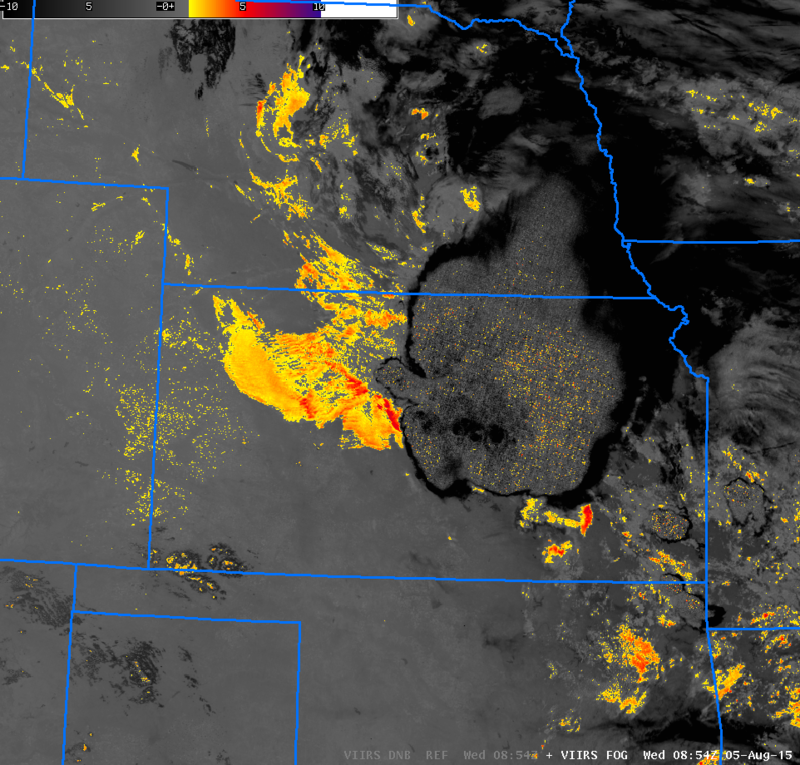 The larger values from MODIS — especially at 0755 UTC — suggest the fog was initially at small-scale horizontally. 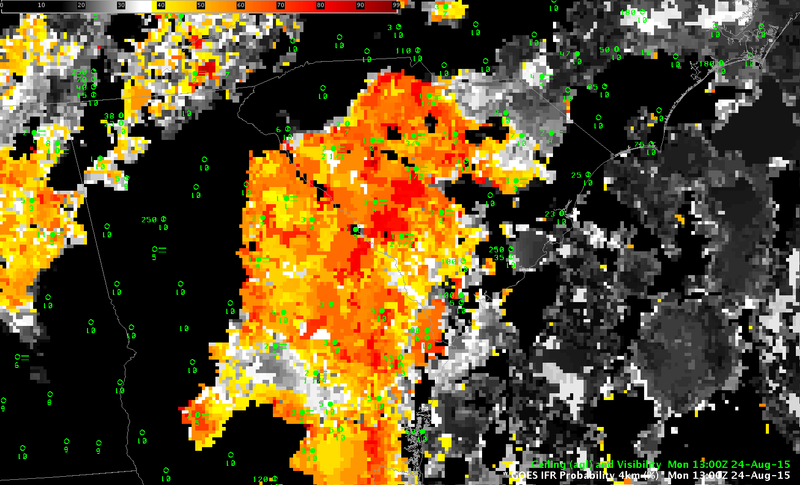 The 1-km resolution pixels from MODIS better capture any small-scale features. 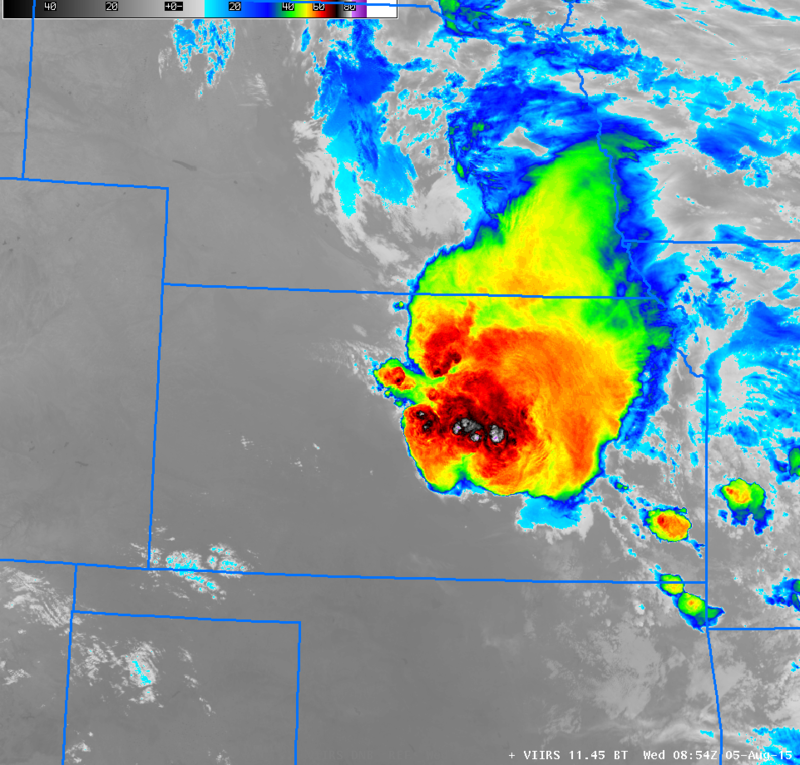 This entry was posted in MODIS, Southeast, Uncategorized on August 4, 2015 by Scott Lindstrom.